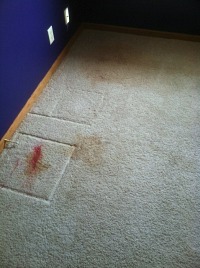 Carpet Cleaning Lincoln NE - What Things Differentiate Us From Other Service Providers? 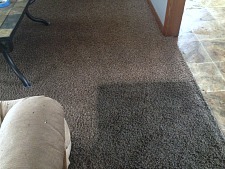 Carpet Cleaning Lincoln NE - Contact Us! There are many things that make up the Pro Care Cleaning difference! 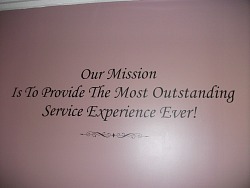 Our Mission Statement is stenciled to our wall in our office, so that we see it everyday. We can't tell you that we always succeed, but we can tell you that we are always striving to live up to our Mission Statement! Can We Skip The Office? It's not uncommon for us to have a client request that a room be left off the cleaning list. This door led into the home office. The homeowners wanted to skip the office because they felt it wasn't that dirty. In a way, they're correct, the carpet in that office was not in particularly bad shape. There was, however, enough soiling that there was a very clear "clean line" where the wand stopped. This is common. Notice how we made sure that the line was inside the door frame...that way when the homeowner closes the door the only thing visible to guests will be clean carpet. This was a very challenging job! The carpet was a relatively inexpensive polyester. In addition, the carpet had not been well cared for; there were many drink spills, paint spills, crusted on food remnants...you name it. Of course, there were also some pet accidents as well. The key in situations like this is to follow our cleaning steps scrupulously. What may seem like overkill in some situations is absolute necessity in dealing with a challenge like this. We can't promise that we can undo the things that have been done to your carpet, but we can promise you that we will follow this cleaning plan. Furthermore, we can tell you that while perfection may be unattainable, the improvement most carpets experience is shocking! 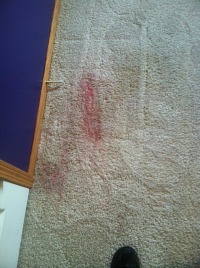 Carpet Cleaning Lincoln NE - Ink Removal From Carpet! This situation became apparent when the homeowner moved furniture out in preparation for cleaning. There were a couple drink spills plus ink from a pen that had gotten worked under a piece of furniture and leaked big time! As always, we followed our process step by step. 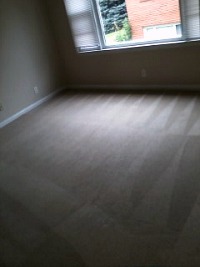 The first pic is with the carpet untreated. 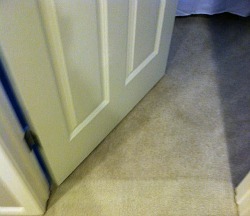 The second pic is after vacuuming, pre-spotting/pre-spraying and mechanical agitation. The pic to the left is after extraction. Is it perfect? No. But it's a big, big improvement! Sometimes the best outcome is to take a problem and improve it to the point where only the homeowner can still tell that something untoward occurred in that area. Sometimes the work we do isn't all that glamorous! Frequently though, the work we do really helps people...and we feel good doing it. This job is a case in point. One of the homeowners became ill and was unable to make it any further than the side of the bed. It was a particularly nasty bit of ick! The picture to the above left shows what we found upon arrival. We treated the spot with a specialized odor and stain oxidizing product. The picture to the above right shows what the spot looked like after this initial treatment. At this point, we haven't done anything else with the spot and it already is vastly improved! 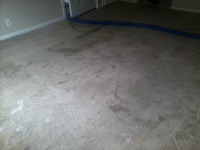 The last picture to the left shows the carpet after extraction and application of a post-cleaning treatment. Oftentimes folks feel a little bit embarrassed about problems like this. They shouldn't though, it's just part of the human condition. We get sick sometimes...so do our kids, grandkids, dogs, cats, etc...Rest assured that we will always treat any situation with professionalism and respect for you and your home. This carpet has an interesting story behind it. This home is owned by a man who has been suffering with a debilitating disease called Huntington's Disease. He's obviously a very independent fellow, living on his own and doing a good job of it. But cleaning and other tasks that seem ordinary and mundane to so many of us present a real challenge to him physically. We went in, along with a small group from our church, and cleaned the home top to bottom! As you can see, it made quite a difference! Of all the jobs we've done over the years, this one was the most gratifying by far. 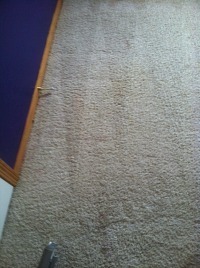 Click Here To Go From Carpet Cleaning Lincoln NE To The Homepage!